Will Mario Lemieux Ever Retire Jaromir Jagr's Jersey? Will Mario Lemieux Ever Retire Jaromir Jagr’s Jersey? 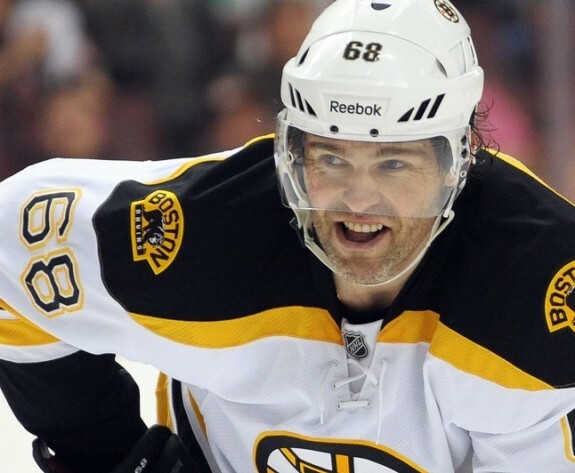 Jaromir Jagr deserves to have his Pittsburgh Penguins’ jersey retired. There are too many Penguins’ fans who do not respect Jagr enough to agree. Even after all Jagr has accomplished for the franchise, people continue to bash him even though he is the greatest player behind Mario Lemieux to throw on a Penguins’ sweater. Keep in mind who Jagr’s idol was when he arrived on the scene as an 18 year-old. It was no coincidence why Jagr eventually became known as Mario Jr. Lemieux ran the team and influenced every major organizational decision. No matter what Lemieux wanted, he was rarely criticized as the savior of the Pens’ franchise. One theory is that Mario had a hand in the departure of legendary coach Scottie Bowman after Bowman won a Stanley Cup for the Pens. Giving Lemieux superstar treatment and freedom paved the way for Jagr to feel like he was entitled to the same liberty. Many fans are still upset over the way Jagr acted before he left Pittsburgh. He ran the show in the Pens’ dressing room and was not an ideal captain by any means. Jagr trashed ex-Pens’ coach Kevin Constantine and the Ivan Hlinka reign was over in Jagr’s mind before Hlinka knew every players’ name on the Pens’ roster. Jagr seemed to bang heads with players and coaches on a regular basis. The franchise was in danger of folding and Jagr was raking in dough the Pens couldn’t afford to pay. With Jagr’s attitude and lucrative contract, the time had come for the Pens to part ways with Jagr. Regardless of what took place behind closed doors, Jagr was an integral piece in saving the Pittsburgh Penguins’ franchise. He kept the franchise afloat when he beat the number-one seeded New Jersey Devils in the first round of the 1999 playoffs all by himself. Jagr has scored 681 career NHL goals. The one that is most memorable to him is the overtime goal he scored in Game 6 against the Devils that playoff year to save the Pens from possibly moving to Kansas City. Despite the off-ice issues, Jagr deserves to have his jersey hanging from the rafters of the CONSOL Energy Center. He is one of the greatest players to ever play the game of hockey, and should be rewarded. Jagr is the second leading-scorer in franchise history. He sits behind Lemieux who is one of the top three players all-time in league history. If Lemieux were never drafted by the Pens, Jagr would already have his #68 jersey hanging from the ceiling. Jagr had more game-winning goals in the regular season (78) and the playoffs (14) than Lemieux. Jagr was as clutch as they come for the Pens. He scored four overtime-winning goals in the playoffs and was a huge part of the Pens winning back-to-back Stanley Cups. Jagr had the best years of his career with the Pens from 1993-94 to 2001-02. Many people fail to realize how purely talented Jagr was while his point totals were hampered by the poor state of the NHL during the “Clutching and Grabbing” era. Jagr didn’t make excuses, but there is no doubt that he could’ve scored more points if the game was as wide open in his prime as it was in the 1980’s and early 90’s during Lemieux’s prime. With much less ice to work with than his predecessor, Jagr still put up 100 point seasons unlike any other world class player of his time. You may not like the way Jagr handled his return to the NHL when he said that he owed Lemieux everything and would take a discount to play in Pittsburgh. You may not appreciate the way that Jagr left the Pens when he was traded to the Washington Capitals. No matter what your opinion is of Jagr, he stands as the second greatest Penguins’ player behind Mario Lemieux. Jagr won five scoring titles (four in-a-row) and one league MVP as a Penguins’ player. Five scoring titles with the Pens puts Jagr among the game’s elite. Only Wayne Gretzky, Gordie Howe, and Lemieux have more scoring titles in their careers. Jaromir Jagr is a living legend. His number deserves to be hanging from a banner next to his scoring titles above the CONSOL Energy Center ice. Will Mario invite Jagr back to the franchise with open arms once Jags hangs up his skates for good? The chances are slim but Mario Lemieux will make the final call whether Jagr’s jersey is retired. Mario realizes that Jagr was immature and made many mistakes in his younger days. Has Lemieux forgiven Jagr, or was all of the drama too hard to forget? If we strictly analyze hockey, there’s no question that Jaromir Jagr deserves an unforgettable evening of dedication at the CONSOL Energy Center in the near future.